The LFBC Math program is a solid one, beginning with the knowledge that God created everything, and, because of this, an order has resulted. 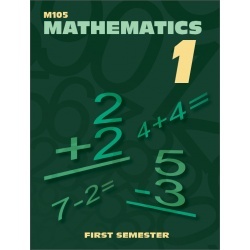 It teaches that students can expect exactness, preciseness, and completeness in arithmetic/mathematics, just as they can expect it in God's creation. We start with the basic facts. Strong emphasis is given to learning the multiplication tables early. Later we proceed to the more complicated and abstract concepts in the upper grades. Number recognition, counting, and writing 1 - 250; counting by twos, threes, fives, and tens; addition facts through 13; subtraction facts through ten; before/after numbers; adding and subtracting two-digit numbers; recognizing and counting money; telling time to the nearest quarter hour; fractions: one quarter, one half, and one third; and story problems. 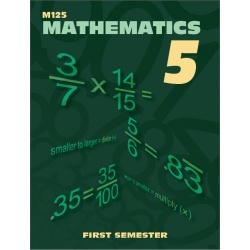 Number recognition, counting, and writing to hundred thousands and beyond; addition and subtraction facts through 18; adding and subtracting two-digit numbers; multiplication and division facts to 5; measurement to one-quarter inch; scale drawings; addition with carrying to tens’ place and hundreds’ place; subtraction with borrowing from the tens’ place; multiplying and carrying to the tens’ place; solving money problems; telling time to the minute; fractions: finding a fraction of a group; and story problems. Students will review and build on concepts learned in second grade. Place value of numbers; three-digit addition with carrying, three-digit subtraction with borrowing; two-digit and three-digit multiplication; two-digit divisors with checking; multiplication and division tables to 12; telling time; addition and subtraction of fractions; averaging numbers; measurement problems; bar graphs and pictographs, recognizing geometric shapes; and story problems are all part of this year’s work. All basic concepts and skills learned in third grade are reviewed. 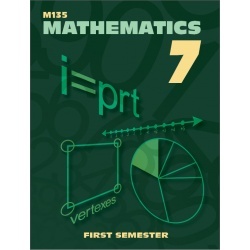 Place value to millions; English and metric measures; perimeter and area; factoring; adding, subtracting, and multiplying fractions; multiplying three-digit factors; reducing fractions; time lapse; multiples; basic geometric shapes; divisibility rules; five steps in division; reading a thermometer; writing decimals; and word problems are all taught and reviewed. All basic concepts learned in previous grades are completely reviewed. 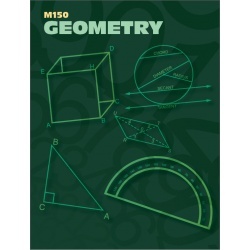 Place value to billions; rounding off whole numbers, money, decimals, and mixed numbers; factoring; multiples; converting measures within the same system; perimeter and area; geometric ideas and shapes; line graphs, bar graphs, grids and scale drawings; measurement equations; algebraic equations with addition, subtraction, multiplication, and division; three-digit divisors; four-digit multiplication; division of decimals; fractions as decimals; introduction to percent, decimals with percent, percent as fractions, and word problems are presented in understandable ways. Students review and build on concepts learned. Place value of whole numbers; rounding off; review of fundamental skills in addition, subtraction, multiplication, and division; fractions and decimals: adding, subtracting, multiplying and dividing; decimals: changing to fractions; English and metric measures, converting from one metric unit to another; percents as fractions, decimals; measuring angles; bar graphs, line graphs, circle graphs; perimeter, area, circumference, and volume; algebraic equations; and integers are all taught. Students review and build on concepts learned. Place value of whole numbers, rounding off; review of fundamental skills in addition, subtraction, multiplication, division, fractions, and decimals; English and metric measures, converting measures; percents: changing percents to fractions and fractions to percents; changing percents to decimals and decimals to percents; finding percent of a number; perimeter, area, circumference. 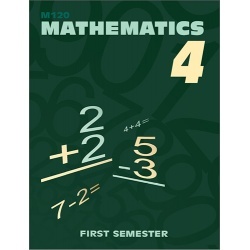 This course includes a review of all mathematical topics. Place value of whole numbers, rounding off; review of fundamental skills in addition, subtraction, multiplication, division, fractions, and decimals; percents: converting to decimals and fractions; graphs; English and metric measures, converting measures, review of linear, square, and cubic measure; basic geometric concepts; using formulas; measuring angles; negative numbers in addition, subtraction, multiplication, and division; equations; and exponents are taught and reviewed. Algebra I is built logically, moving smoothly from one concept to another. Letters are used to represent numbers in expressions and equations. Expressions are simplified and equations are solved. 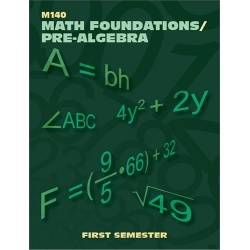 As they work with the axioms, rules and principles of algebra, students are encouraged to use their reasoning ability. Revised 2007. This is a study of form, position, and magnitude. As the student progresses in this study, he or she will come to a better understanding of the connective thread that ties all parts of this subject together. A knowledge of the vocabulary terms are explained so that the student can have an understanding of them in a geometric sense. 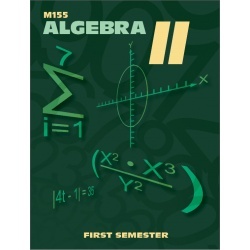 Algebra II is built logically, moving smoothly from one concept to another. Letters are used to represent numbers in expressions and equations. Expressions are simplified and equations are solved. 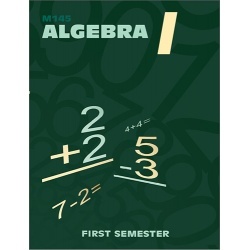 As they work with the axioms, rules and principles of algebra, students are encouraged to use their reasoning ability. 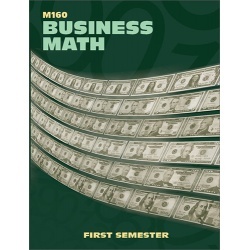 This course will lead the student into some new areas that will benefit him/her in everyday living. It includes important information on scriptural principles of personal finances including local church tithing, Faith Promise Missions giving, and conservative views of taxes and financial planning. Preparing a budget, doing income taxes, balancing a checkbook, writing checks, percentage, percentage of profit, life insurance, health insurance, buying a car, the costs of owning and operating a car, credit, and many other exciting and practical topics are covered.